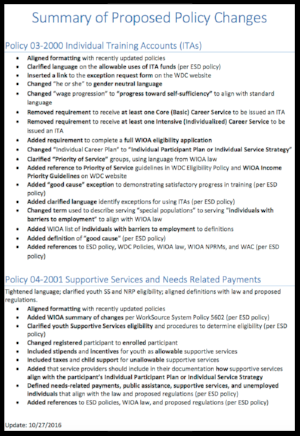 Two policies of the Workforce Innovation & Opportunity Act (WIOA), regarding Individual Training Accounts (ITAs) and Supportive Services, have been released for public comment. Please send comments to info@seakingwdc.org by Monday, December 5th. Visit by clicking on the image, or via our "Policies & Guidelines" webpage, here. The Workforce Innovation and Opportunity Act (the Opportunity Act) was signed by President Obama on July 22, 2014 after passing Congress with broad bipartisan support. The Opportunity Act reauthorizes and amends the Workforce Investment Act (1998) through important workforce system reforms. The Opportunity Act empowers local areas and private sector-led workforce boards with the responsibility of developing a strategic, integrated plan that supports economic growth and labor force needs intended to grow the capacity and performance of the workforce system. Local Workforce Development Boards are required to develop a four-year plan that describes the strategies, programs, and activities they will carry out to implement the Opportunity Act. The WDC has developed an action plan for Program Years 2016-2020 based on considerations of local workforce needs and thoughtful contributions from partners and stakeholders. The goals and objectives identified entail collaboration across the full span of the workforce development system and utilize the breadth of the system’s assets and expertise. After many months of planning and community engagement, we are proud to present to you the 2016-2020 Seattle-King County Workforce Development Plan. The WDC welcomes comments and input. Per the guidelines, the plan will be available for public comment until noon on May 31, 2016. Please click here to view the plan. Please email comments or questions with your contact information to hmello@seakingwdc.org by the May 31, 2016 deadline.